This XBMC for O2 Joggler release will directly boot into XBMC. It has no GUI for linux installed, so it is as lightweight as possible. It eats only around 100Mb of RAM, boots really fast and it is build on Btrfs filesystem. The base for this distribution was Ubuntu Base/Server 12.04 LTS (Precise) (Joggler Image v1.1 - 17/06/2012) from BuZZ. - this image has enabled root account!!!! If you want you can disable it or. change default password. XBMC for O2 Joggler will fit on most 2GB USB and SD cards ((1.990.520.832 bytes). I have made it as small as possible. Download image and uncompress it with (7Zip, WinRAR,...). Get Win32DiskImager from https://launchpad.net/win32-image-writer/0.1/0.1. Then unpack the .img.gz file using 7-zip or. WinRAR. Run W32DiskImager.exe, and select the unpacked .img file. Choose the drive of your USB stick, SD card and press 'Write' to write the image. - addon XSqueeze can now auto-find Squeezebox media server (there are no touch buttons, but maybe developer will integrate them or. will try to code it by myself). I have also tested it to control it over iPad, Android and it is working without problems (test were done with original Logitech software). Also I think the crashing was caused by some missing dependencies, what I have also fixed in version v0.9. 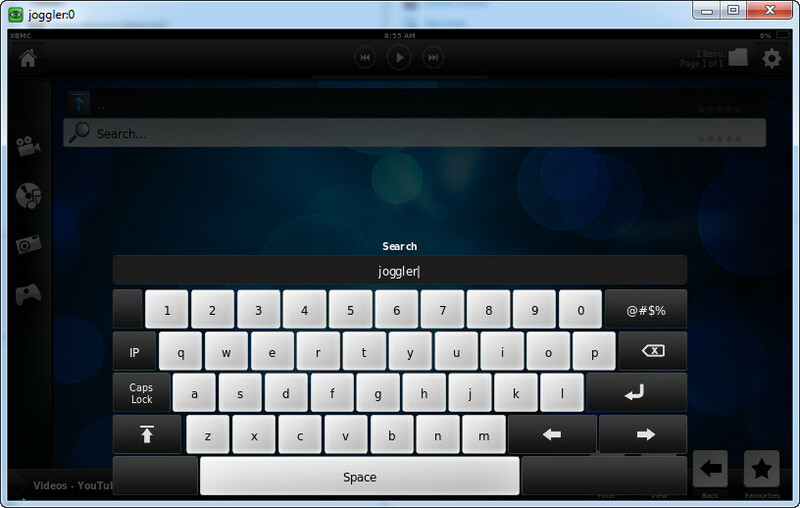 It is ATM hard to use player on XBMC forO2 Joggler because of missing touch buttons on player interface but hopefully this will soon change. - First I have decided not to include TVHeadend into the image by default but short how to will follow, someday , because I want to keep the distro as small as possible and not everybody needs TV backend. - I want to build auto updating distribution so the changes will be applied automatically. Do not to expect this in short. - XBMC plugin for network management is fully usable now. - maybe integration of TVHeadend client for DVB-T reception. - integrated Network-Manager to manage wireless connections for those using Wi-Fi from inside XBMC (Located under Programs). - wired network is not working right. This release v0.7 will work with wireless network, but I can not promise that it will work with LAN. Last edited by iLLiac4 on Tue May 28, 2013 6:56 pm, edited 33 times in total. I just have a few questions. You say the wifi is not working yet. Due to it's location this joggler is wifi only - I'm guessing that means that I would get the image as is and not be able to have any further add-ons or update add-ons at the moment unless I hook it up to my router? Also, I really want to be able to get roobarb!s squeezeplay on this joggler. Would there be a simple way for me to download it onto this os? Finally, what does it mean to have root account enabled and why might I consider disabling? Sorry! Wifi is not working ATM at least not user friendly. With root account you can do everything so you have to now what are you doing. For example login as root with WinSCP and you can edit all files without restrictions. Some gurus do not like that. About Squeezeplay... not there yet I have my joggler only few days but never say never. I was thinking in direction to run it from inside XBMC with some scripting as I have already implemented possibility to launch scripts from inside XBMC. It could work the way from XBMC into Squeezeplay, but then it must be done also in reverse order, so from Squeezeplay into XBMC. Maybe will try in few days after I am done with polishing XBMC for O2 Joggler. Feel free to donate and report bugs. This looks excellent and will make a lot of people very happy!! I think I have solved the network with wireless and wired LAN. Now both are working (DHCP). You can now also have two IP adresses at the same time. 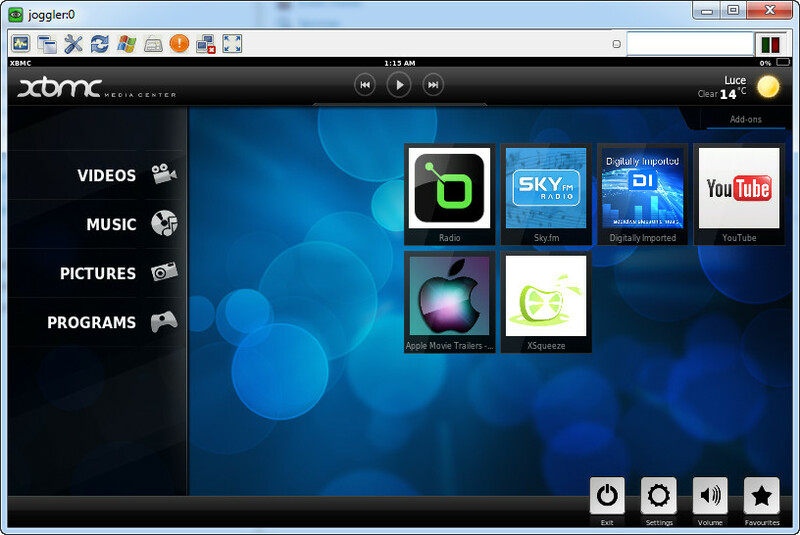 Configurable from inside XBMC (wireless). Image will be available tomorrow for download. I can't wait to get home to give this a try. ..
Hawsey, been thinking of you since I saw this this morning! You'll probably beat me to it so it'll be good to know how you get on. spoyser wrote: This looks excellent and will make a lot of people very happy!! Will add into the next version. I couldn't get on line with it but had a good play with the skins e.t.c and a lot of work has gone in to setting this up , I can't tell . Leaving it on tonight to test it , will get my powerline adapters out of the loft tomorrow to see if I can get on line and get it all set up . 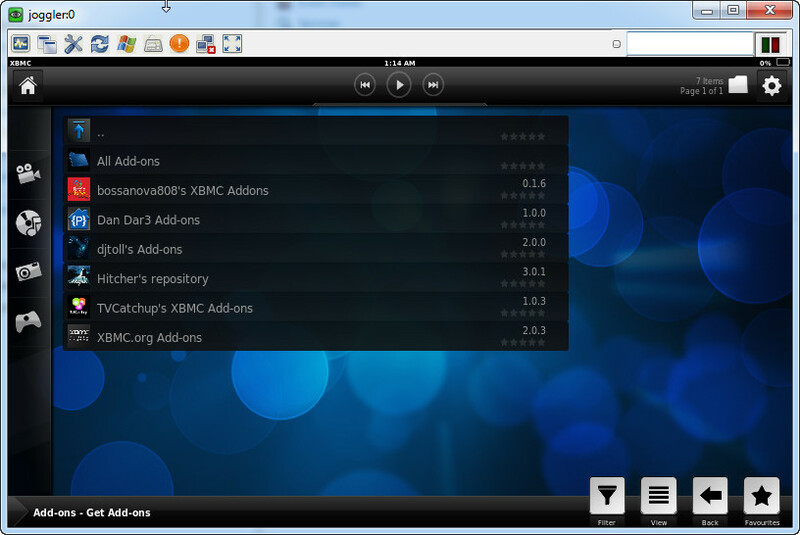 So here is new build XBMC for O2 Joggler version 0.7. Last edited by iLLiac4 on Wed Aug 22, 2012 12:16 pm, edited 1 time in total. Thanks so much for your hard work - I'll be giving this a go tonight! Just out of curiosity, as I'm still new to xbmc and i've not heard of XSqueeze, is it different to roobarb!s squeezeplay? Last edited by ilovemyjoggler on Wed Aug 22, 2012 12:24 pm, edited 1 time in total. Location: somewhere near Rochester castle. 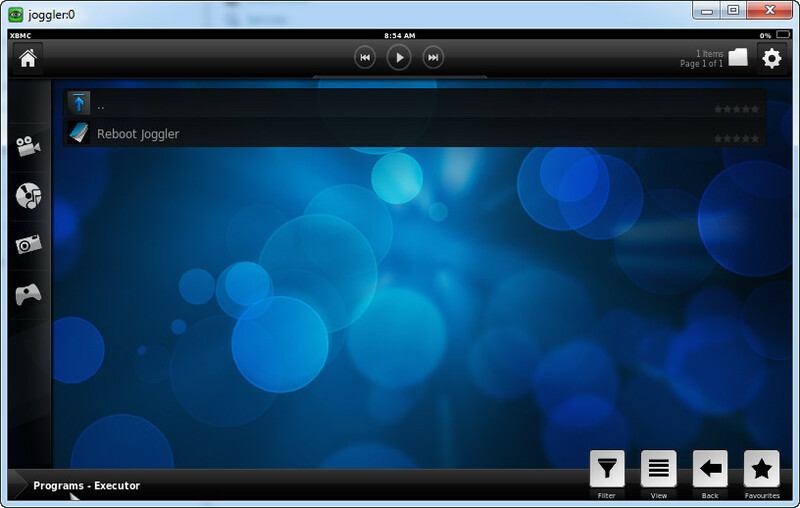 Another new build of XBMC for O2 Joggler version 0.8. Do not forget to donate so I can cover the hosting costs. TNX. Last edited by iLLiac4 on Wed Aug 22, 2012 4:21 pm, edited 1 time in total. Excellent work! Never used XBMC on any device before but I may give this a go to see how it runs. Also, what program are you using to get your Joggler screen displayed on your PC? Thanks. leepea: Also, what program are you using to get your Joggler screen displayed on your PC? Hello. I thought I'd try this out (v0.8) tonight but am having a bit of trouble and can't get it to work. I may be doing something wrong. I've added wifi details in programs and it says I'm connected but it isn't downloading anything - is there a step I'm not doing? Thanks. Edit: It says 'busy' in the top right hand corner - not sure if that is relevant. I'm also getting quite a few script errors (due to wifi connection?). Last edited by ilovemyjoggler on Wed Aug 22, 2012 10:53 pm, edited 2 times in total. Loving this , cheers , I have had 0.7 running all day , nice and sweet , no issues over ethernet .Will be trying 0.8 tomorrow night late on possibly over wireless and report back .